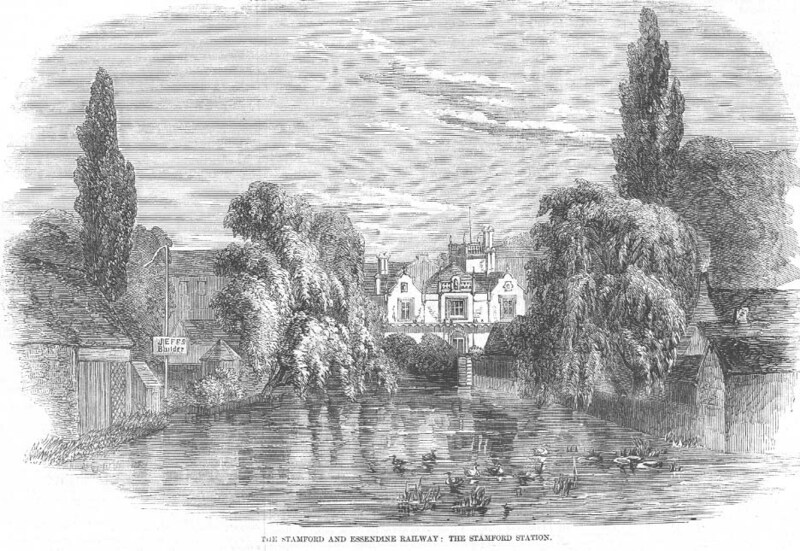 The Stamford and Essendine Railway. This railway was opened for public traffic on the 1st November. It forms a junction with the Great Northern main line at Essendine, which is distant nearly twelve miles north of Peterborough; and by means of this communication the fine old town of Stamford is brought within about two hours of the metropolis. The works, which are constructed for a double line of rails, were commenced about two years ago, under the auspices of the Marquis of Exeter, the promoter and principal proprietor of the line. We engrave (from a drawing by Mr. W. Hurst, jun.) a picturesque View of the Stamford Station, as seen from the bridge at the foot of St. Mary's Hill. It is a handsome stone building of Elizabethan character, and consists of a booking-hall, with offices and residence for station-master. The principal front includes two peaked wings, having ornamented gables, and a central projection with perforated parapet, carrying a shield in sunk panel, containing the arms of Stamford, surmounted with a coronet, and relieved by foliated scrolls and ribbon, bearing the name of the railway and the date of its construction. The front elevation is pierced by mullioned windows of varied dimensions, after Burghley House, and bisected for its entire length with an overhanging screen or verandah, ten feet in width, which is carried upon brackets of appropriate design, and affords effective shelter for passengers alighting at the door of the booking-hall. This hall, which measures 27 feet by 32 feet 6 inches, is lofty and of peculiar design—the roof being carried upon cambered timber beams, set in pairs, and springing from neatly-carved corbels firmly grafted in the walls. It is lighted principally from the ceiling, which is partitioned in recessed compartments, having pendant ornaments at the intersections of the panels. A gallery, supported on tastefully-scrolled brackets, runs round the building, and is faced with elegant cast-iron railing; from which, at the angles, rise ornamented columns with globular gas glasses at their tops. This gallery leads, on the one hand, to the directors' room and offices; and on the opposite side are ranged the living-rooms and other apartments of the station clerk. On the ground-floor, opposite the entrance, and looking over the passenger platform behind, is the booking-office; and on each side the hall are placed the first-class waiting-rooms, parcels and other offices; while the area is provided with movable seats for second and third class passengers. At the south-east angle of the building is a massive stone tower, in which, on the ground floor, are the porters' and lamp rooms, &c.; and above are "stores," well protected by a never-failing tank of water on the roof, which is surrounded by an open parapet, with projecting angles, carved finials, and columnar chimney-stack. At the back of and adjoining the booking-hall is the passenger platform, covered by a light wrought-iron trellised roof of timber and glass. The up and down lines of railway are on either side the platform, and the whole is illuminated by lanterns hanging from the tierods of the iron roof, and by wail-lamps mounted in cast-iron brackets of a neat and novel character. The station is approached through light wrought-iron gates, hung on posts of pierced castings, harmonising with the principal elevation of the booking-hall and offices before described. The goods warehouse, granary, and other buildings common to terminal stations are plain and neat in design, and the arrangements generally are well compacted and complete. The whole of the works were constructed by the late Mr. Thomas Hayton, the well-known contractor on the London and North-Western Railway, from designs and under the superintendence of Mr. William Hurst, the Company's engineer.